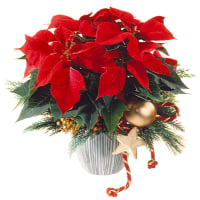 According to a Fleurop survey, poinsettias are the most popular flowers during Advent. Let us tell you more about their discovery, their Hollywood career and their sense of time. You'll also find information here about Poinsettia Day and much more. 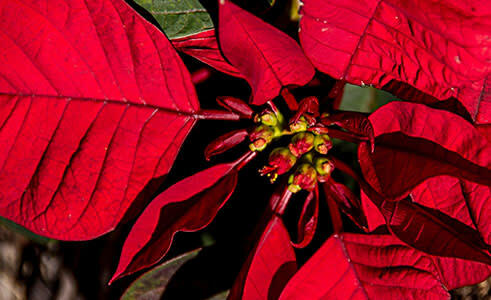 Poinsettias speak Spanish – olé! Good poinsettias are "Swiss made"
Did you know that in its original home – the deciduous forests of Central and South America – the poinsettia grows up to four metres tall and blossoms all year round? It's therefore no wonder that naturalist Alexander von Humboldt took it back to Europe with him when he came across this eye-catching beauty in Mexico in 1804. In Europe, the plant received the botanical name Euphorbia pulcherrima ("the loveliest of the Euphorbias") as far back as 1833. 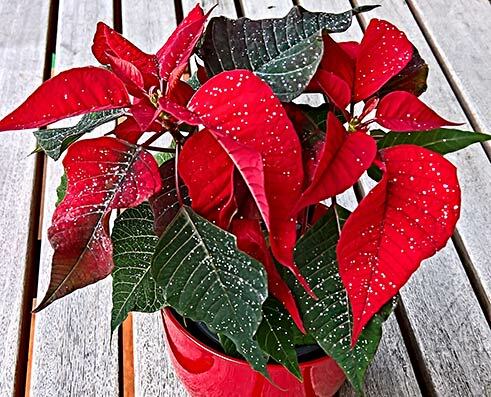 Nevertheless, it took a long time for it to move into our homes and conquer our hearts: many years of breeding were needed before the poinsettia was able to survive as a pot plant in heated rooms in the late 1950s. You'll find mood-makers by professionals HERE. 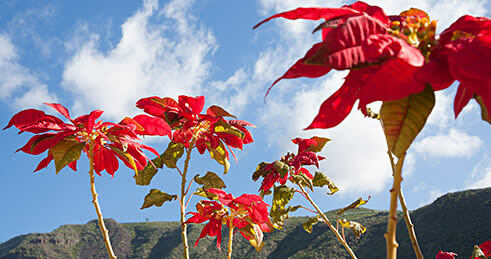 Poinsettia Day is celebrated on 12 December. The date goes back to the anniversary of Joel Poinsett’s passing away. 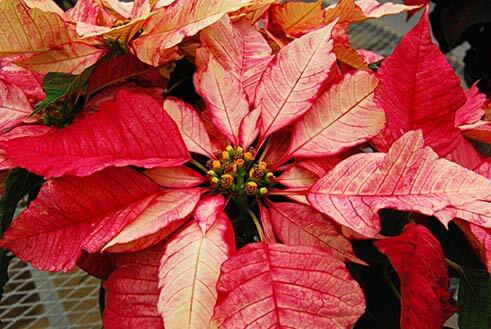 The first US diplomat in Mexico, he came across an unfamiliar plant there while travelling: the poinsettia. He was so excited by it that he sent it to friends and botanical gardens in the USA. 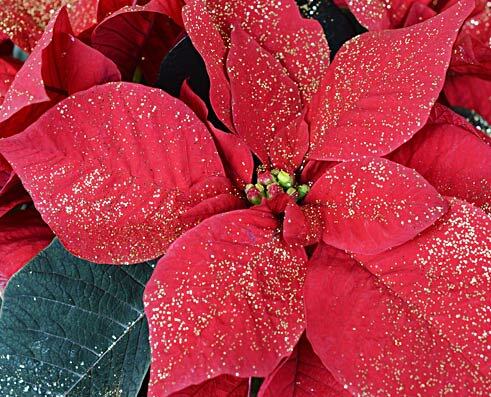 There, the plant was given the common name "poinsettia" in 1836 and Poinsettia Day was introduced in the mid-19th century in memory of the US diplomat. 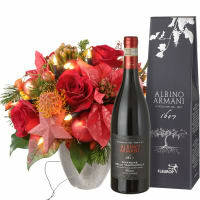 Poinsettias are given as gifts on that date, not only in the USA but also in other countries. This custom is also attracting more and more adherents in Switzerland. 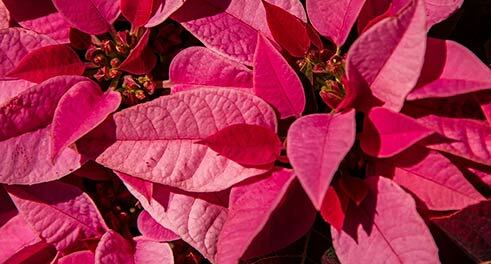 You'll find our care tips for poinsettias HERE. 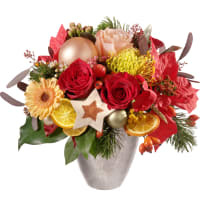 The poinsettia launched its world career where every star's glamorous story originates: Hollywood, California. In the early 20th century, an American immigrant of German extraction called Paul Ecke discovered red plants growing wild near his farm. Such was the fascination they exercised that he tried to cultivate them. He recorded initial successes with fresh-cut poinsettia branches that he sold at prominent sites in Hollywood in the American "holiday season". To boost their fame, he christened them "Christmas Stars" and advertised by sending free flowers to TV stations and even appearing on television. From that point onwards, our poinsettia's progress was unsToppable. The many names of our poinsettia demonstrate how well known it is. The Aztecs called it "leather flower". However, following its triumphant progress across the world, other common names arose. 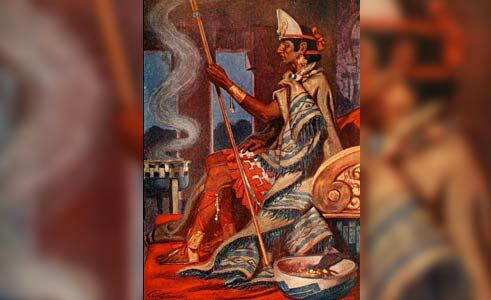 Today it is known in Mexico and Guatemala as the "Flower of Christmas Eve", in Chile and Peru as the "Inca Crown" or "Crown of the Andes". In Turkey, it's called the "Atatürk" flower in honour of the founder of the Republic. The Egyptians call it "Daughter of the Consul" in memory of Joel Poinsett. To the French, it's the "Love Star". And in Hungary, it's simply known as the "Santa Claus flower". Here in Switzerland? To us, it isn't only the "Christmas Star" or "poinsettia", but also the "Advent star" or "Star of Christ". Whatever the truth may be, it is the most popular Christmas plant according to a Fleurop survey. Two touching legends are told about the poinsettia. One flourished around the time of the Aztecs and says that the bracts at the Top of the plant turned red when they were touched by drops of blood from an Aztec goddess who was unlucky in love. The connection with the Christmas festival, in contrast, comes from a Mexican saga. According to this story, a poor girl who wanted to give the Christ child in the manger a gift sowed seeds in front of the church. Deep red poinsettias grew,a symbol of the Star of Bethlehem for the local people. This is probably why it was used by the Franciscan monks in Mexico for their Christmas procession from the 16th century onwards. It’s as if poinsettias have a built-in clock. Because as soon as the nights start to become longer than the days, the plants begin to produce flowers and bracts. 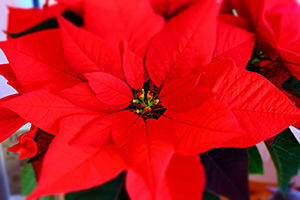 Poinsettias are "short-day" plants and only bloom when there's less than 12 hours of light in the day. Gardeners make use of that fact. And they leave nothing to chance in that sensitive development period. 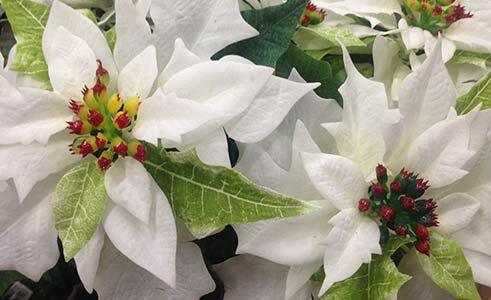 They make major efforts to make sure that we can enjoy poinsettias on time every year during the Advent and Christmas period. They ensure that the length of the day and the temperature are "always right" in the greenhouses, thereby creating ideal growing conditions. 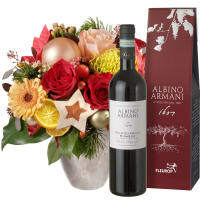 As a result, the "stars" come into bloom at the right time and give their fans a colourful Advent and Christmas season. Although the classic red poinsettias are always popular, new colours are also winning hearts and placing the poinsettia at the centre of modern living environments. These include gentle rose, delicate cream, bright pink, a charming salmon pink-apricot shade or plants with cheeky, speckled bracts. However, the varieties not only differ in colour but also in shape and size. From "minis" to tall-stemmed varieties, from poinsettias for hanging baskets to bushes, quite literally everything is available in the flower shops. What's more, poinsettias not only come with standard leaves, but with pointed ones, oak leaf-type, toothed ones or crinkly ones. 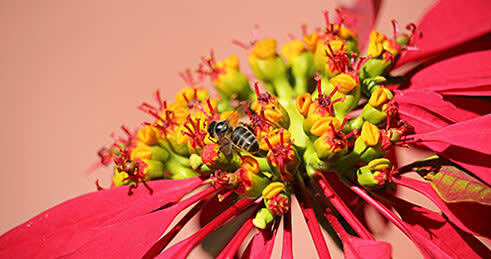 Basically what we love about the poinsettia is not its flowers, but the wonderfully colourful bracts. The actual flowers are an unassuming yellow shade and are to be found at the centre of the bracts. You can tell from the flowers how "old" a poinsettia is. If they are fully open, the poinsettia is about to wither. When you buy one, you should therefore make sure that the little knobs inside the bracts look fresh and are just starting to open. 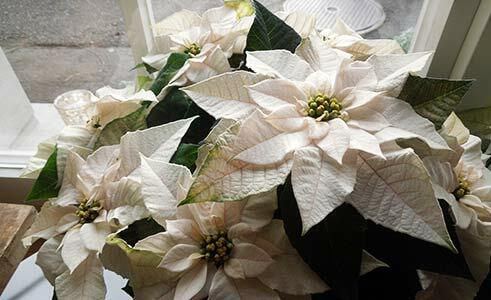 More tips: it's best to go for Swiss quality, and don't buy poinsettias that are standing in the draughty entrance to a shop or even outside. These are often already damaged by the cold. 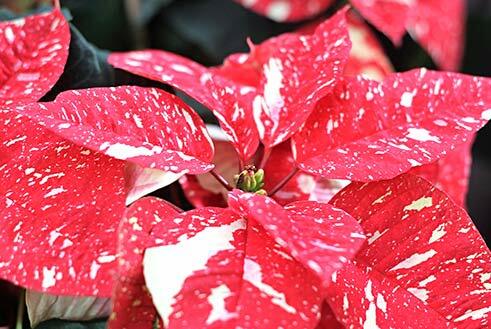 In addition, healthy poinsettias have lush green leaves and firm bracts. Poinsettias can live for a long time. You may therefore still have last year's one at home. To make sure it blossoms, it's best to give it less than twelve hours of light every day. Around eight weeks before Christmas, place it in a darkened room for 13-14 hours every day. Alternatively, you can put a pail or a cardboard box over the plant. 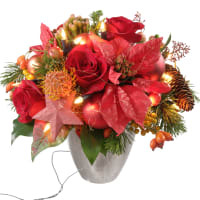 That way, you will encourage flowers to form and can then enjoy a poinsettia in bloom – just in time for Christmas. 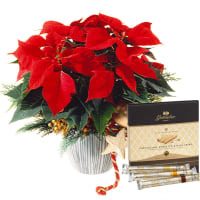 Did you know that the poinsettias offered by professional florists are "Swiss made"? That's because mid-sized to large plants in particular would be very difficult to transport undamaged. 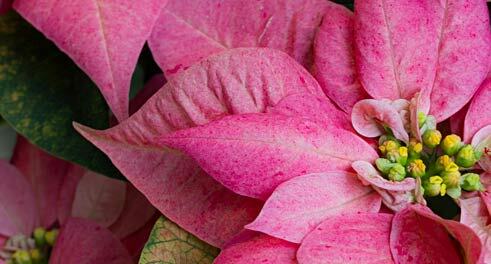 What’s more, poinsettias are fussy in other ways: they hate draughts, for example, and they should never be in temperatures below 18 degrees Celsius. These are good reasons to look for Swiss quality. Please do that. Otherwise, you may be disappointed.